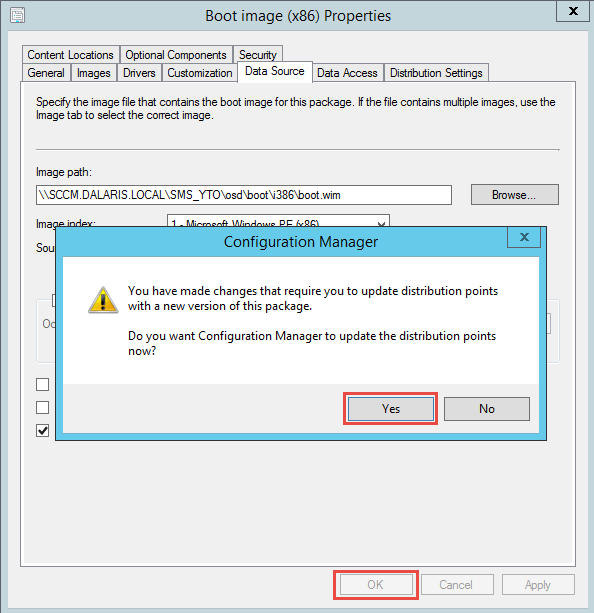 In this blog post we will go through the boot images and distribution point configurations for SCCM 2012 R2. 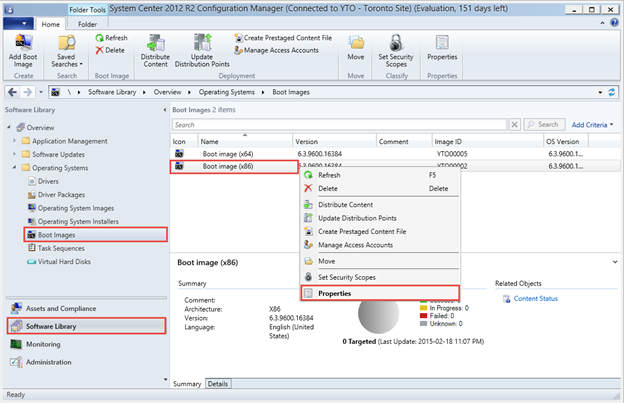 With PXE boot, we are able to deploy Windows 2012 R2, Windows 8.1, Windows 8, Windows 7, etc.. to the network using SCCM 2012 R2. 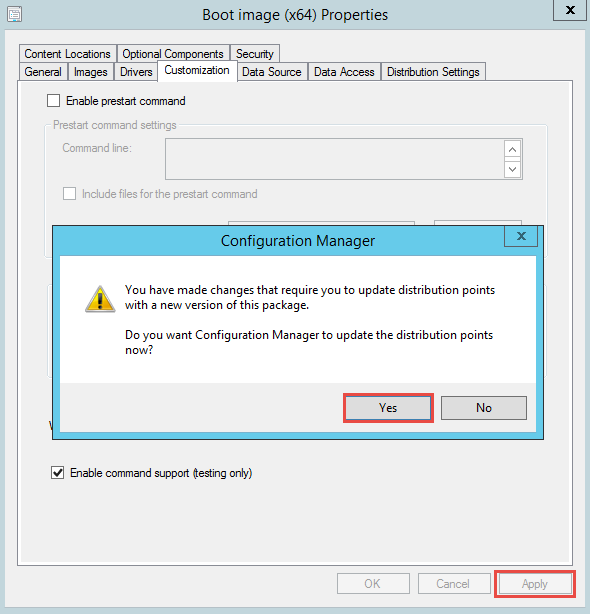 There are several ways in which one can deploy Operating Systems to Configuration Manager client client computers. They are as follows. 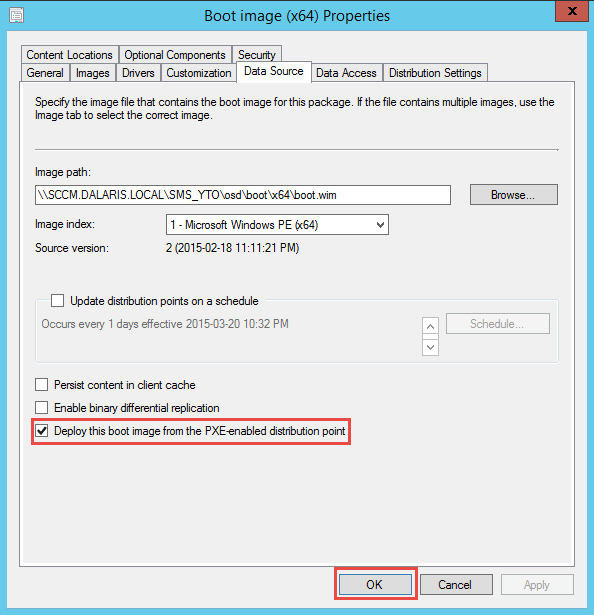 PXE initiated deployments: The OS system image and Windows PE boot image are sent to a distribution point that is configured to accept PXE boot. Any client in the network (which we allow) can use PXE boot to receive the OS from the network. 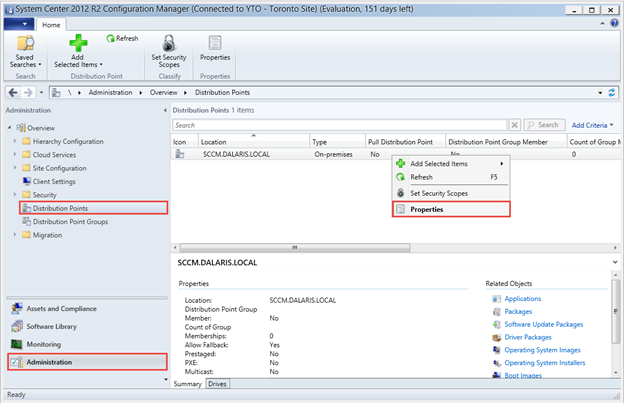 Multicast deployments: OS system images are sent to the distribution point and any number of clients can simultaneously request the image to be deployed to them. 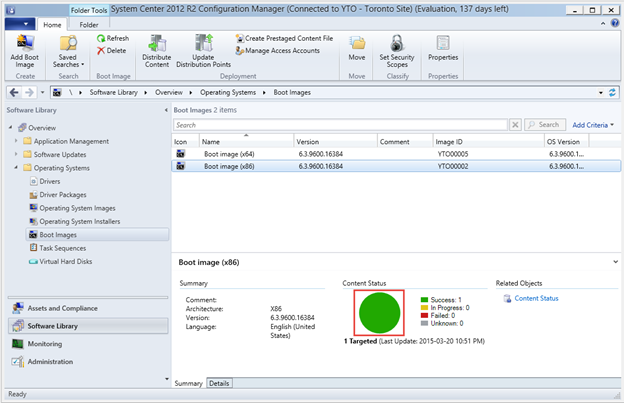 Bootable Media deployments: The OS and its required contents are stored on the network. 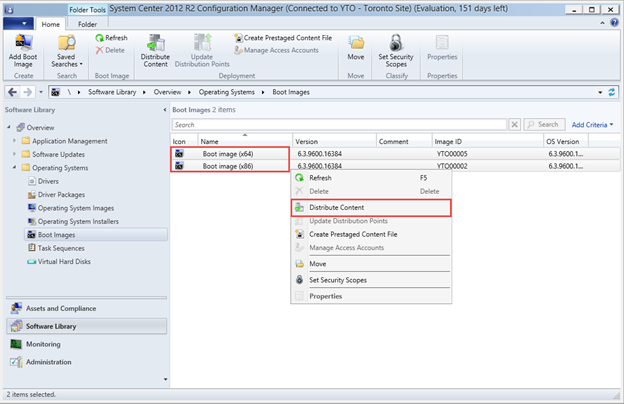 A client computer can request the system image and these contents when it starts. The administrator can modify the images and their contents without having to re-create media for clients which leads to huge time saving and cost saving. Standalone media deployments: in low bandwidth situations, you it might not be pfeasible to deploy systems over the network, this option is viable. 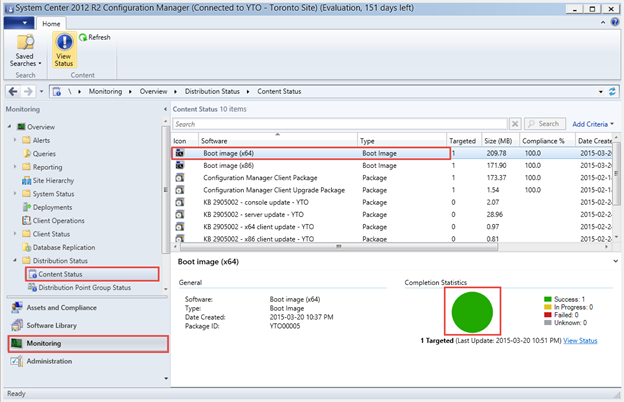 Prestaged media deployments: Usually deployed by manufacturers that are not connected to the SCCM infrastructure. That is, the systems are partially provisioned. This is called prestaged media deployment. First, we need to enable PXE support for the client. 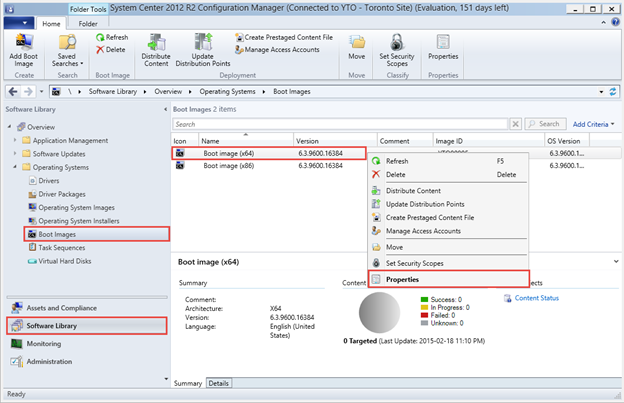 Open the SCCM 2012 Console. 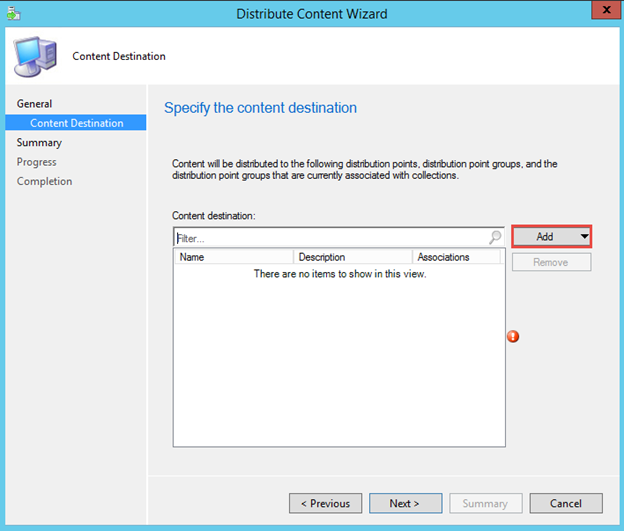 Click Administration, right-click Distribution Point and click Properties. 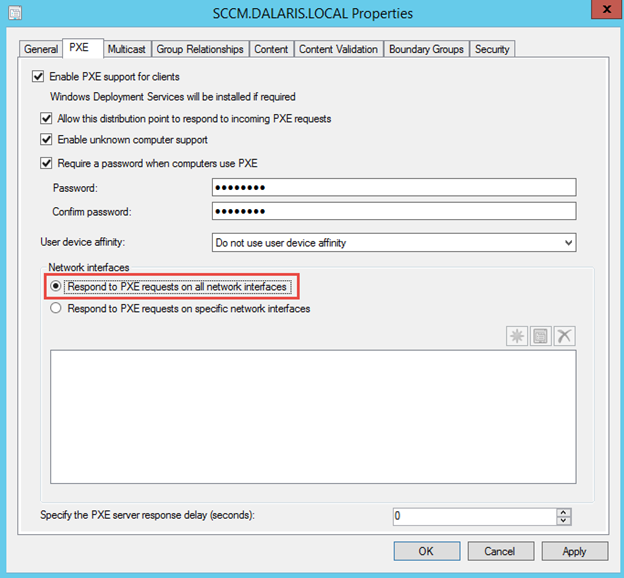 Checkbox “Enable PXE support for clients“. Click Yes when you receive the warning. 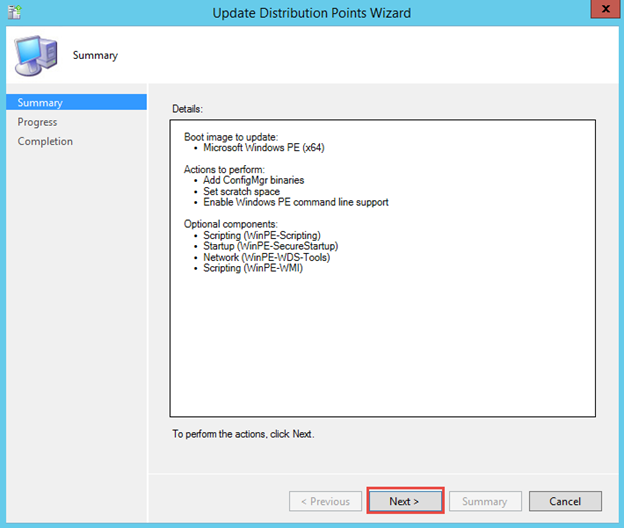 Select the “Allow this DP to respond to incoming PXE requests.” This means that the Distribution Point will start responding to incoming PXE requests. Also Enable unknown computer support. 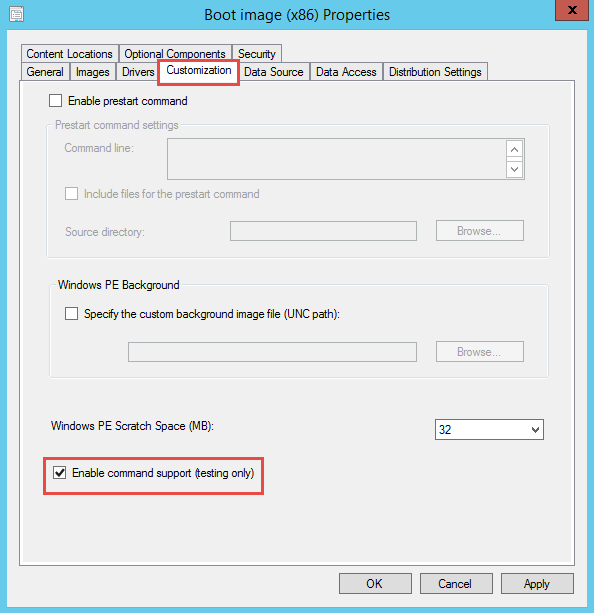 This will allow any computer clients that are not discovered by SCCM to be able to request PXE image from the DP. Click OK to confirm the warning. Now enter a strong password to protect the PXE deployment. Also select the appropriate User Device Affinity. Do not use user defive affinity means you do not want to associate a user to a device. 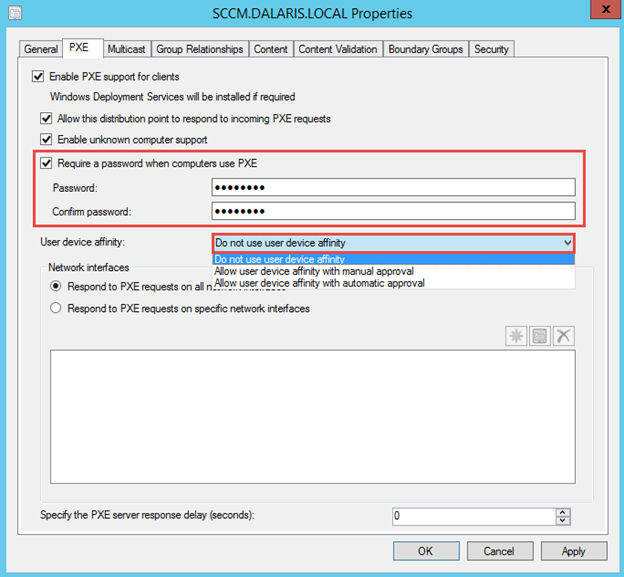 Allow user device affinity with manual approval means user will be associated with device upon administrative approval. Allow user device affinity with automatic approval means user will be associated with deivce even without administrative approval. In this lab, please choose Do not use user device affinity. 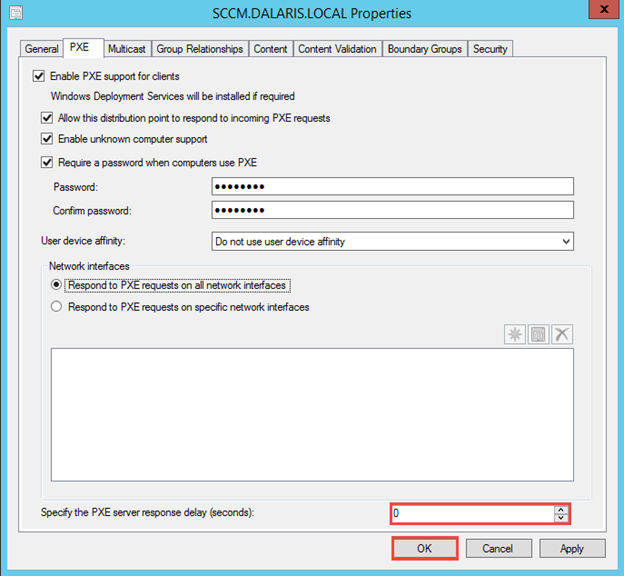 Select Respond to PXE request on all network interfaces. Select 0 for the delay. 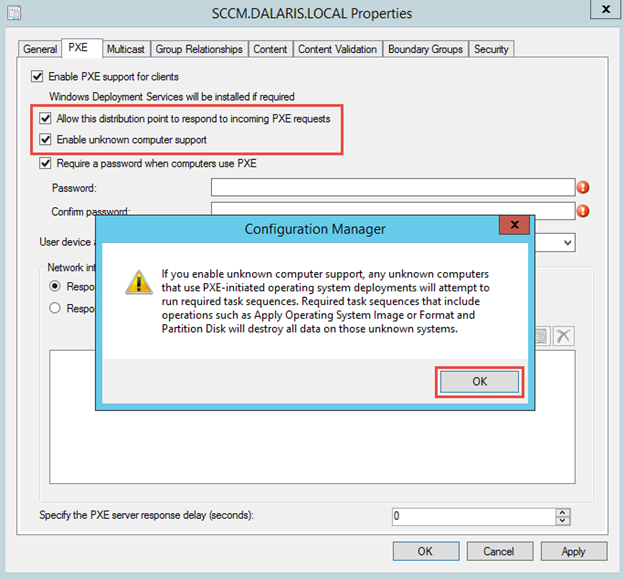 This option specifies the number of seconds the DP will delay before responding to requests in the event that multiple PXE enabled DP are used. 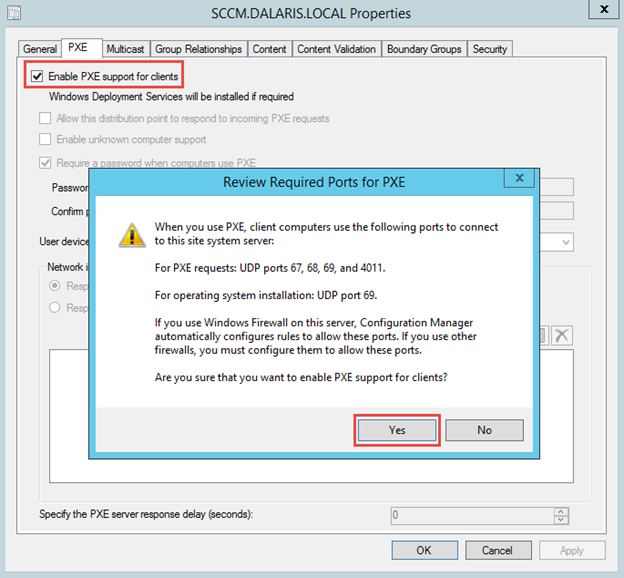 By default, CM PXE service point respond to PXE request first. Click OK when done. Boot Image (x64) for 64bit deployment. Boot Image (x86) for 32bit deployment. We need to first enable command support for both of these images. 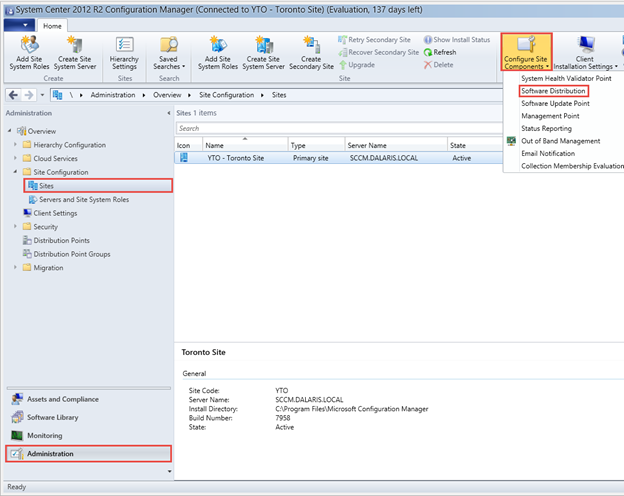 This will make it easy for the administrators to troubleshoot deployment issues should they arise. Click Software Library, Operating System, Boot Images. Right-click Boot Image (x64) and choose Properties. Select Customization tab, checkmark on Enable command support and click OK.
Click Apply and click Yes. 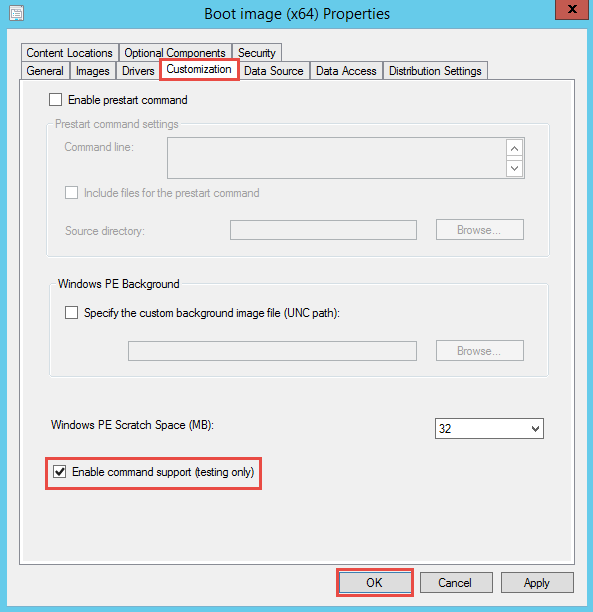 Ensure that the option “Enable this boot image from the PXE enabled DP” is checked, Click OK. Perform the same to Boot Image (x32). 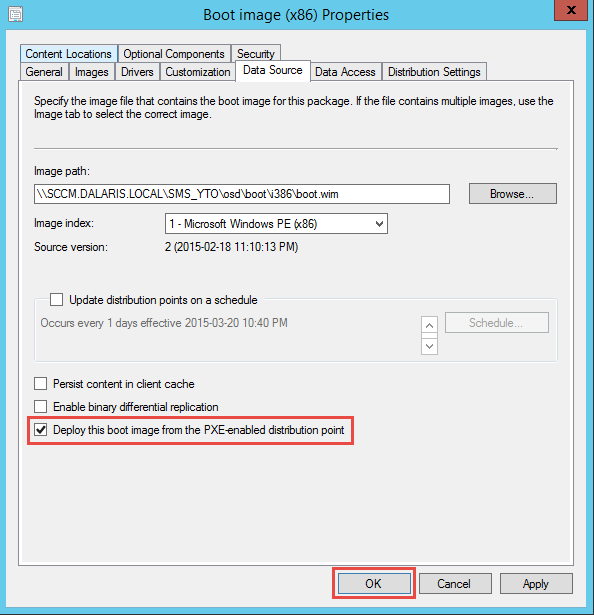 Enable the “Deploy this boot image from the PXE-enabled DP“. 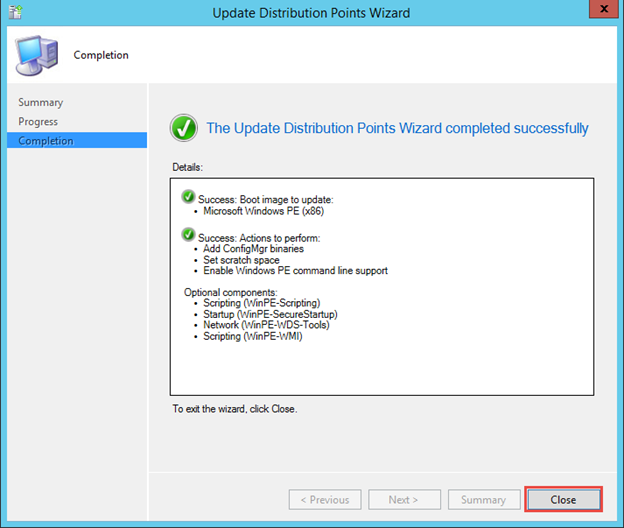 Click OK.
Click Next to update the Distribution Point. 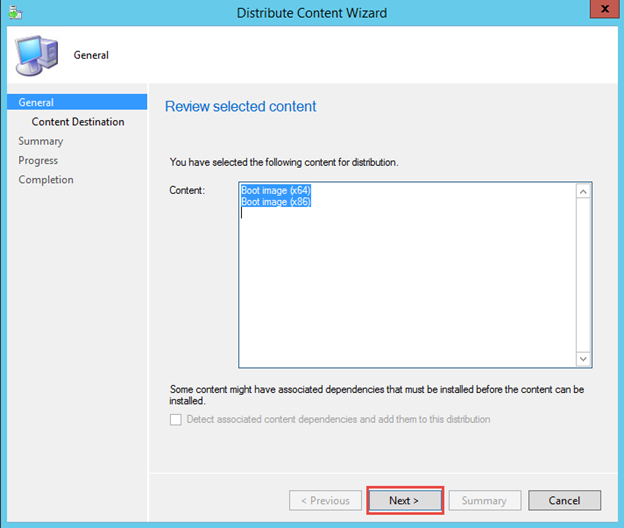 Now we need to distribute the content to the distribution point. 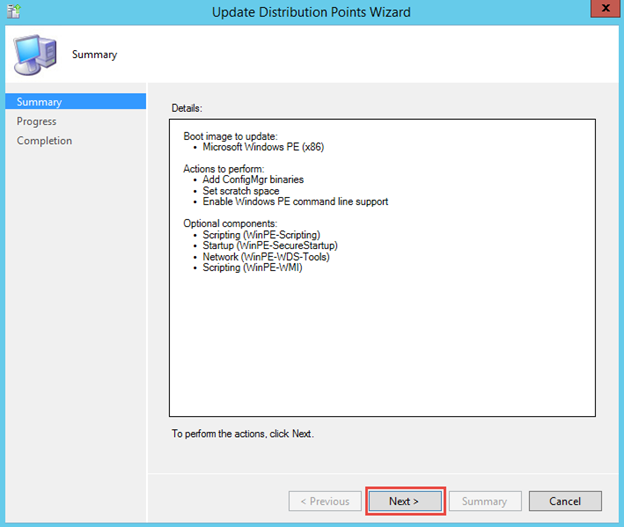 If it had already been distributed, and you have made some changes after that, you need to perform an update to the distribution point. Now, let’s distribute the content (boot images) to the DP. Highlight both images and choose Distribute Content. 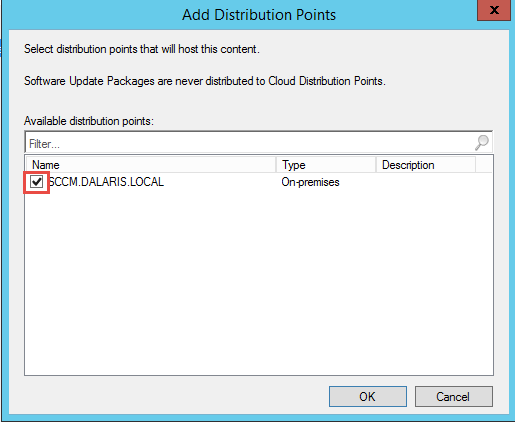 Choose Distribution Point and choose the SCCM server. 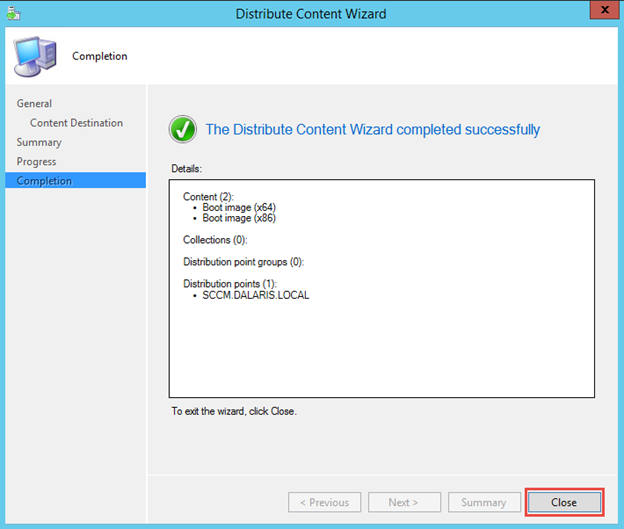 Make sure you have the big green circle indicating that the content has been successfully distributed to the DP. Verify the above for Boot Image (x86) as well. 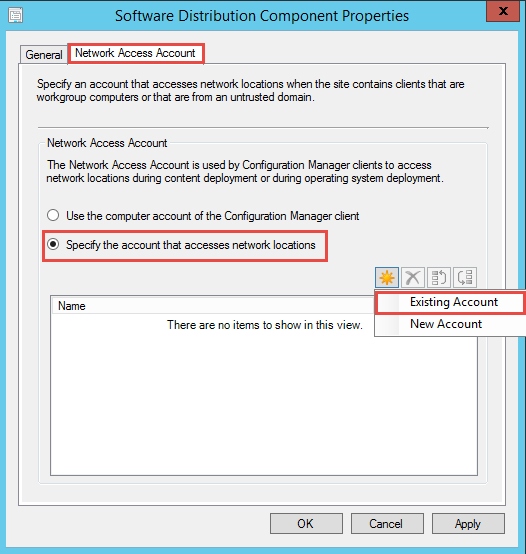 Now create a Network Access Account with the appropriate permission to deploy Operating Systems. 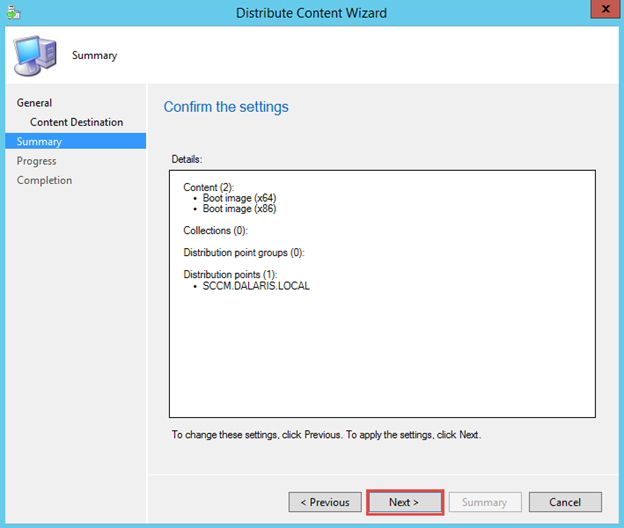 To do this, click Administration, expand Overview, Site Configuration, and click Sites. 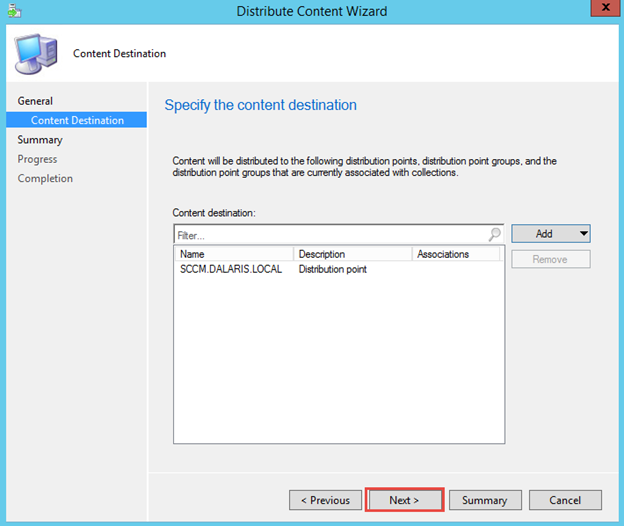 Click Configure Site Components and choose Software Distribution from the drop-down list. 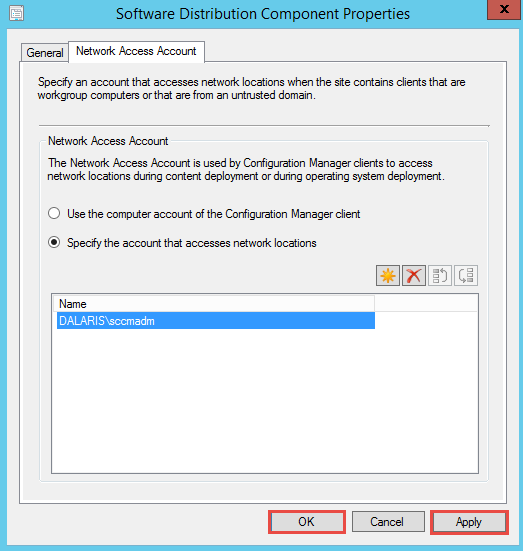 Choose existing account and select Dalaris\SCCMADM account we created at the beginning of this lab series. 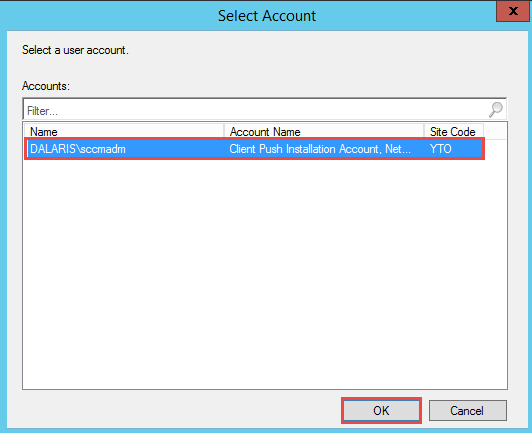 Select the account and click OK.